Creek Stewart is a survival expert who has honed his survival skills through his lifelong study of outdoor living and thousands of hours in the field. 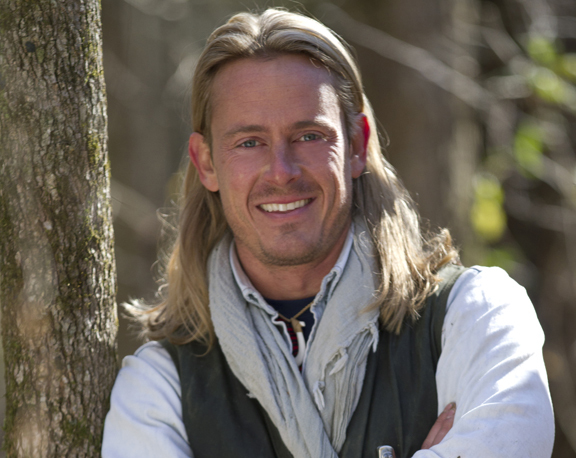 He started leading survival skills courses at the age of 21, and is the owner and founder of Willow Haven Outdoor Survival Training School, located in Central Indiana. In 2013, Willow Haven was named one of the “5 Top Adventure Trips in the US” by Chicago Magazine and one of the “Top 10 Survival Schools” by MSN Travel. In 2014, Creek became the host of the original series, Fat Guys in the Woods, on The Weather Channel. In every episode of Fat Guys in the Woods, Creek brought three average Joes back to the woods to survive for a week with only one objective: to teach them the skills that make a man, a man. Find past episodes of Fat Guys in the Woods on YOUTUBE. As The Weather Channel Survival Expert, Creek now hosts their very popular show SOS HOW TO SURVIVE, where he and his group of experts evaluate past survival scenarios and find the teaching moments inside. Creek has been featured as a guest expert in outlets including, TODAY Show, Fox & Friends, The DOCTORS, Men’s Fitness Magazine, Backpacker Magazine, Outdoor Life Magazine, WGN-TV, WISH-TV 8, The Weather Channel, Living Ready Magazine, American Survival Guide, Huffington Post, MSN News, Lifehacker, and The Daily Beast, as well as numerous radio and online outlets. In addition, Creek is a published author with three books under his belt. His first book, Build the Perfect Bug Out Bag: Your 72-Hour Disaster Survival Kit, is an amazon.com best-selling title. His second book, The Unofficial Hunger Games Wilderness Survival Guide, was released in Spring 2013 and Build the Perfect Bug Out Vehicle released in Summer 2014. His latest title, Build the Perfect Bug Out Survival Skills is slated for release in Spring 2015. He is also a regular contributor to the popular men’s interest blog, ArtofManliness.com.